Excellent opportunity to own a profitable hotel business in the Central Pacific area of Costa Rica, Playa Hermosa, a top surfing destination with beautiful pristine beaches and year round tourism. The resort sits at the base of the mountains with nature, tropical forests, wildlife, waterfalls, and many activities nearby. It is also just 10 minutes to Jaco Beach with international restaurants, casinos, shopping and lively nightlife, and 15 minutes to Los Sueños Marina & Golf course. This award winning hotel is being sold fully operational and “turn key” and is highly rated and recommended by Costa Rica guide books etc. The hotel property consists of 8 Junior Suites all boasting kitchenettes, queen size beds and full size trundle beds, air-conditioning, mini-fridge and cable TV, all set around a beautiful pool and manicured tropical grounds. There is also a 3 bedroom, 2 bath, Owner’s Villa which is currently rented as a vacation villa, as the current owners live off site. Two other vacation villas are located on the property which are investor owned but managed and rented by the hotel. 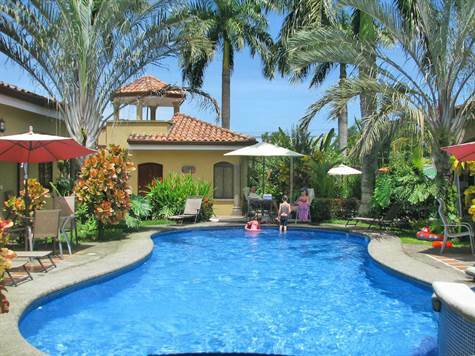 There is a pool-side Rancho with bar pool and a professional kitchen providing breakfast and other meal options. The property is operating as a “condotel”, is fully staffed with security, receptionist, cooks, maids, maintenance and garden staff. Hotel Income streams currently includes hotel sales, food and beverage, management and rental of vacation villas and condos both on and off the property, plus concierge service for tours and excursions and transportation service to local areas and San Jose airport with the hotels own minivan. This hotel can be purchased alone or there is an opportunity to also purchase the adjacent titled lots and / or the 2 investor owned villas and / or 2 adjacent condos all with public road access and municipal services at additional price. This is a unique property with many options for expansion.